The PJBT continued its 20th Anniversary Season with a return trip to Haja Rose Bowl in Allentown, PA for Major #8. This major saw 64 competitors compete in a major format on a secret Kegel Pattern. We had 39 competing in Scratch and 25 in Handicap. Format for the major was 6 games, top 40% bowl 3 match play games, and the top 4 advanced to an eliminator major final…. 4/3/2 winner. In Scratch, Dylan Zimmerman returned from college spring break to take home his 1st title of the season and his 14th career PJBT title. His win now moves him into a tie in the top 10 bowlers in PJBT History Title Wins. He started qualifying with solid games of 203, 238, 221, 223, 268, and 233. Zimmerman stood at +186 for 6 and led the tournament after qualifying. Zimmerman lost the lead in match play as he only went 1-2. However, he maintained a score of +202 for 9 games and was the #4 seed of 4 entering the finals. In the final, it was #1 seed Dawson Miller, #2 Brandon Bohn and #3 Joey Ocello competing against Zimmerman. In the finals, Zimmerman made sure to never be the low man out. He had the high score in every match. Zimmerman shot 212 in Eliminator 1 to advance….254 game in Eliminator 2. In the title match, Zimmerman took on Brandon Bohn. Zimmerman defeated Bohn 236-210 to win the top prize of a $300 scholarship. In Handicap, Allison Stackewicz captured her second title of the year and the 3rd for her family this year (brother won about a month ago). Stackewicz entered the event with a 139 entering average and 54 pins per game. She shot games in qualifying of 162, 147, 168, 213, 149, and 145 for 1308 (+108). Stackewicz lead the field of 25 entering match play. Stackewicz bowled well during match play but lost the lead of the event to #1 seed Sarah Fenicle. However, she was the #2 seed entering the eliminator final against Fenicle, #3 Sicora Floyd, and #4 Carl Kapuschinsky. Stackewicz shot 186 during the first eliminator final and was the second highest score of 4 to advance. In Round 2, Stackewicz survived a close match with a 217 game to advance to the finals. Stackewicz took on Kapuschinsky in the final. In a close final match, Stackewicz outlasted Kapuschinsky 190-180 to win the major title and $300 scholarship. For the major, we gave away over $1700 in total scholarships. Thanks to all 64 who came out. Bonus scholarships went out to Kierra Saldi & Bree Binkowski for the top girls finishers. 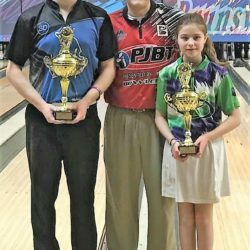 Next week: The PJBT returns to Hiester Lanes in Reading, PA, for our 21 & Under Doubles Event. Sign up now online at pjbtbowlingseries.com. Sunday 3/17 (St Patty’s Day) at 10:30am.